What is bullying? Why do bullies bully? What can you do to protect yourself or your child? Here are 53 tips and tricks to help you more effectively cope with bullying. Tip #10: Cyber bullying is poorly named. Tip #22: Do we really need bullying laws? Tip #23: What is bullying and what can legally be done about it? Tip #26: Punishing bullies doesn’t work. So what does? Tip #31: What is bullying and how do you know if you are a victim of it? Tip #32: Are you prepared to handle different types of bullies? Tip #33: How can you heal after being bullied? Tip #34: How to take your power back from a bully? Tip #35: Why bullies bully and why their insecurity matters. Tip #36: How and why to speak out against bullying? Tip #37: How 1 person can take on a bully and change a school? Tip #38: Understand why bullies bully so that their words won’t hurt you. Tip #39: Why you should never fear a bully. Tip #40: What can you say to a bully so that they won’t bully you anymore? Tip #41: What to do if you witness someone being bullied. Tip #42: What can be done about bullies and why reporting works. Tip #43: Why and how to overcome your fear of the bully in your life. Tip #44: How to loose your fear of bullies. Tip #45: Why and how compassion makes bullies stop. Tip #46: Why intelligence and compassion trump bullies every day. Tip #47: Why reporting bullying behavior is so important. Tip #49: Why standing up to a bully benefits you, the victim and possibly even the bully. Tip #50: Why society can’t ignore the bullying problem any longer. Tip #51: Why we should call bullying by it’s real name. Tip #52: A quick and effective way to overcome your fears and your bully. 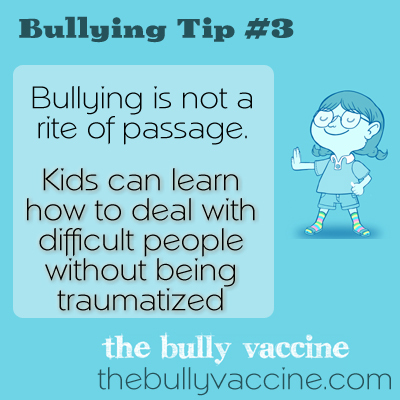 Tip #53: Why is it so hard to get bullies to stop?